In a 2-qt saucepan with a tight fitting lid, heat 1 T. of oil and saute onion until golden. Add garlic and ginger and cook for one minutes, then add paprika, black pepper, allspice, and cayenne and cook for one minute more. 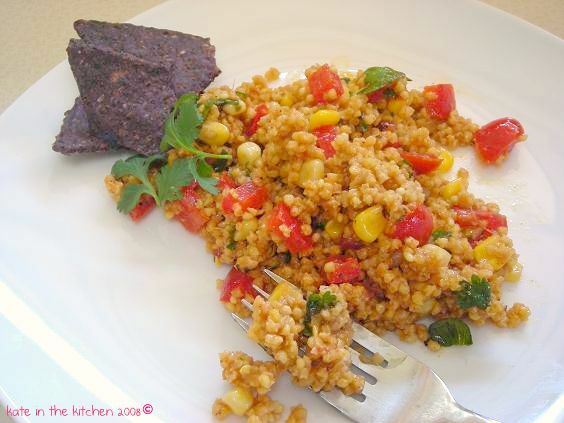 Wash millet quickly and drain; add to pan and stir, coating grains and cooking until hot to the touch. Add water and salt and bring to boil, then reduce heat and simmer on low for 20 minutes before checking for doneness**. When all liquid is absorbed and grain is tender, cover and remove from heat, allowing to steam for 10 minutes. Scrape millet into bowl and cover, then let cool. Whisk remaining oil with lemon juice and brown sugar in a small bowl. 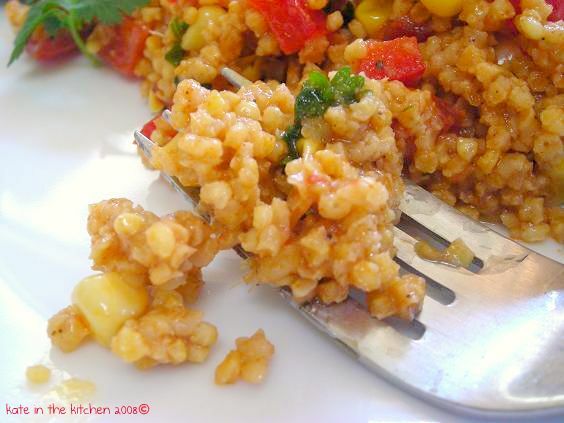 Stir corn, bell pepper, tomato and parsley in with the millet, then drizzle dressing over and stir to coat. Serve topped with peanuts. I used cilantro in place of parsley as I had it on hand; a red bell pepper instead of a green (don’t care for green) and frozen corn instead of canned. **Despite following the cooking instructions faithfully, the grain, I felt, came out to be a little chewier than I expected and being unfamiliar with it, I contacted the cookbook author to ask her opinion on the texture. Her response was that millet can often be confounding in that way, and the amount of water listed in the recipe can sometimes be less than needed and other times it’s just enough. She feels this is simply one aspect of the grain’s natural humidity level, and can be adjusted during the final cooking stages. Once the grain has absorbed all the water, she suggested to quickly stir and remove a few pieces to test for tenderness, and if it is still firm and chewy to add in a little more water- 1/4 to 1/2 cup- quickly bring the temperature back to boiling, then reduce and simmer again for another 10 minutes. I love that you chose a millet recipe. Millet seems like such an under appreciated grain. I remember my Mom making me millet for breakfast with sugar and raisins like oatmeal. This looks like a lovely light summer meal! Thanks for sharing! wait let me get ahold of myself. this looks delish and healthy yum!!! Beautiful salad. I love all the veggies. Looks perfect for summer! !